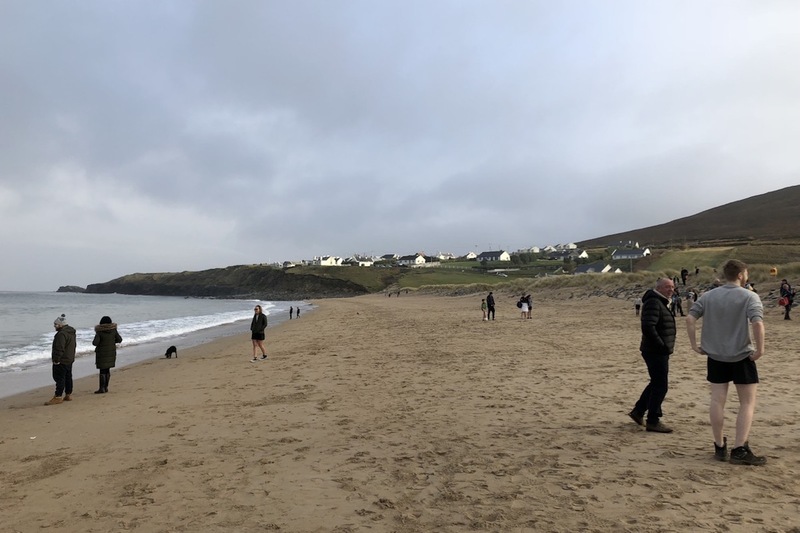 A few days later, it’s New Year’s Day and I’m standing at the Blue Flag Silver Strand Beach in Dugort, all ready for my first adventure in 2019. The Atlantic at the Silver Strand Beach in Dugort. Not a bad place at all for a swim. 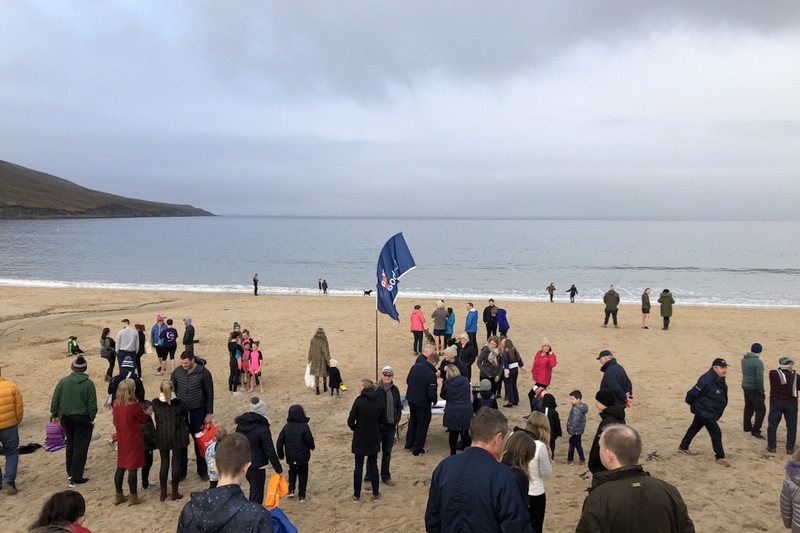 And a blue flag is already up: The one from the Royal National Lifeboat Institution (RNLI). 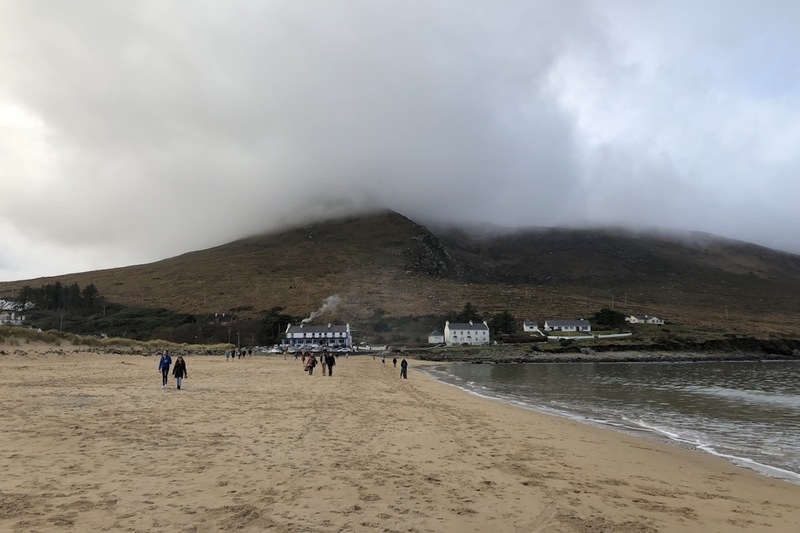 The west end of the beach is dominated by Slievemore, Achill’s second highest mountain. Some beautifully situated houses lie above the east end of the beach. It’s a quite mild and dry day. The weather couldn’t be much better. When I test the water with my feet though I can’t believe what I feel. It’s ice-cold! I hope my activity won’t result in a heart attack. Well, this is the challenge now, isn’t it? I decide to take my clothes off and wait in my swimming shorts in order to prepare myself for my encounter with something wet and cold. It’s getting closer to 1 pm and more and more people arrive on the sandy beach. People of all ages and sizes. Some wear wetsuits, some bikinis and some swimming shorts like me. It’s a colourful and chatty crowd. Ahhh, am I really going to do this? All swimmers are starting to gather behind a red and white plastic mark. The excitement is growing, inside me and around me. There is a joyful energy in the fresh air. I hear people wishing each other a happy new year and breathing in and out deeply. Some are even screaming already. A young woman in front of me is holding on to her male companion. A man next to me is jumping up and down. Everybody seems to have a special way to prepare for the swim. Do I hear people singing a song or is this just in my head? It was just in my head. I feel tense and calm at the same time. A drone is flying above the water and obviously capturing this event. I wave to it and wonder how this gathering might look like from above. Right below the drone, a small lifeboat is swimming calmly close to the shore. Well, we’re raising funds for the Royal National Lifeboat Institution (RNLI) so I suppose we’re in good hands. Then, out of the blue, people are counting down from ten. When we reach zero the nervous chatting and jumping turns into pure running and screaming. Only a few moments later I hit the water. Of course it’s still ice-cold. I scream myself but keep walking at a steady pace. I walk and walk until the water reaches my bellybutton. Then I dive in and do a few strokes. The feeling is absolutely amazing. Fortunately, my heart keeps beating while my body is completely surrounded by this liquid cold. When I come up again I feel revitalized as never before in my life. What a fantastic and refreshing way to start the new year! I did it! And I’m alive and full of energy! In the evening, when I start writing this post, I can still feel this adventure in my legs. 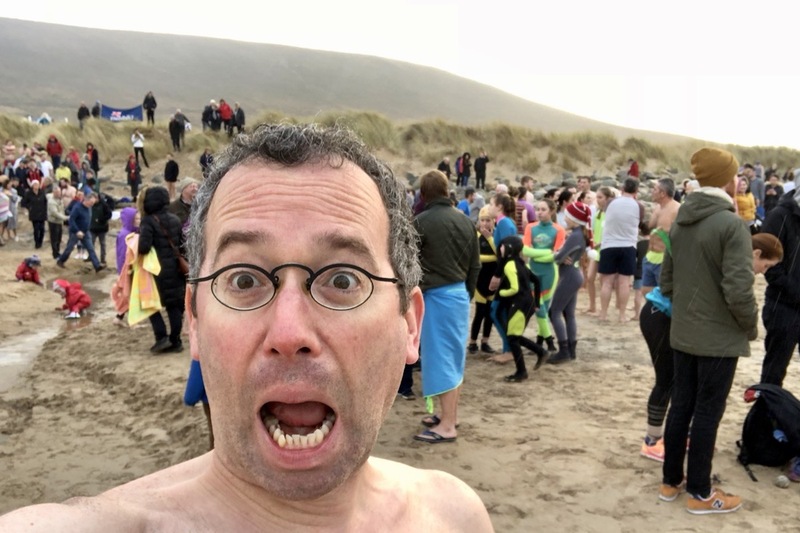 By coincidence I notice that TheJournal.ie has published a video from Achill Tourism on Facebook mentioning that more than 1,000 people took part in the annual New Year’s Day Swim. Absolutely amazing! Finally, I can see how this event looked like from above. I will never forget it! 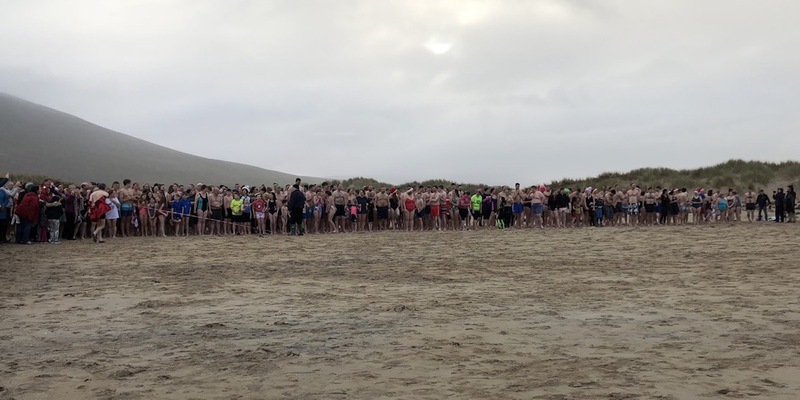 Over 1,000 people took part in the annual new Year’s Day swim on Achill Island in aid of the RNLI today. Video courtesy of Achill Tourism. In the meantime, shorter versions of the video have also been featured on RTÉ News and on Sky News. 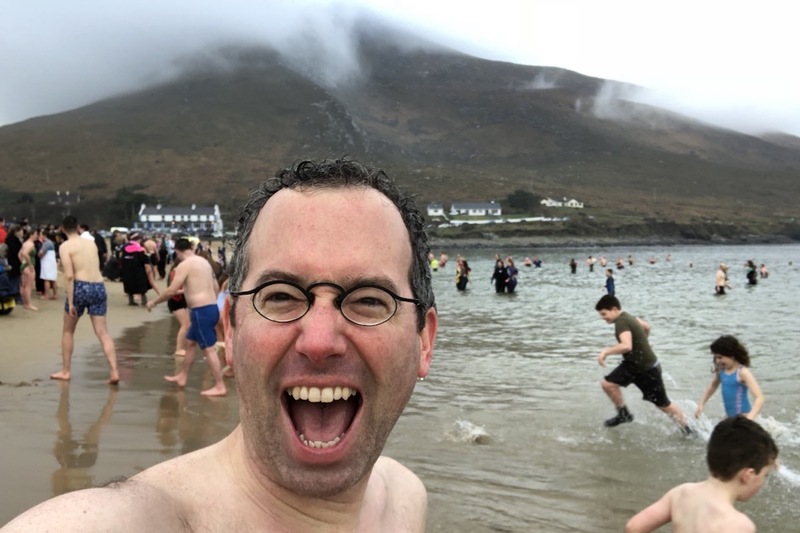 So if you want to do something special on the first day of the year, come to Achill Island and take part in the New Year’s Day Swim. You will never forget it.